"Where do I begin? The ad people who came up with the 'lonely fortune writer' idea should be fired. The brand manager that approved the concept and execution should be fired. Anyone who approved this work should re-evaluate their values. Not only is the work insulting to Chinese/Asians and Chinese/Asian Americans (what with the awful accent, broken English, and idiot like antics), but it also completely degrades the brand and product. 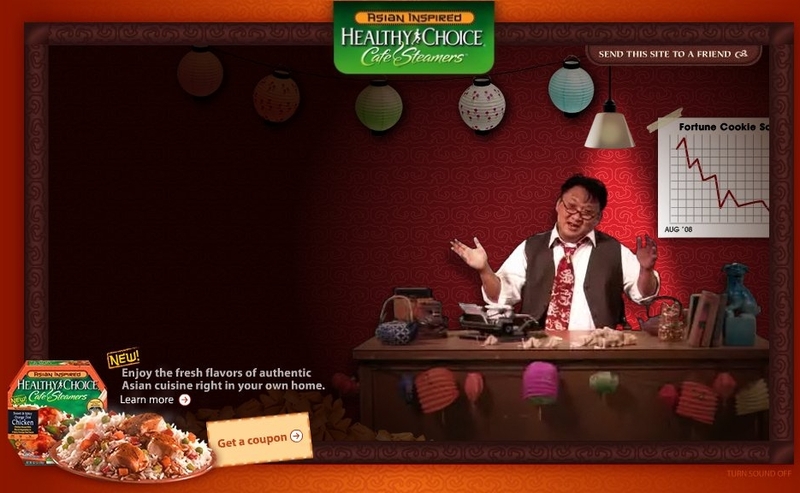 This is the best 'Asian Inspired' concept ConAgra could come up with? The Chinese culture, rich as it is, dating back to 1500 BC, with 50 something ethnicities and cultures, could not inspire them to come up with anything better? Seriously - the fortune cookie? Something that is mostly completely 'American', especially in the form featured, was the best piece of 'Asian' culture they could leverage? I truly question the integrity of their marketing managers and their lack of creative thinking. Instead of leveraging something interesting and special from an Asian culture, they've managed to create something completely irrelevant and distasteful. I'm deeply offended as an Asian American, and doubly so as an advertising exec. They may as well have featured the Spanish Football team." Our reader does make some good points. With so much to choose from the Chinese culture, relying on the whole fortune cookie thing is sad. Though choosing to highlight something other than the fortune cookie's place in China's rich culture might tax the brains of most Americans who can't even remember what the whole "shot heard 'round the world" thing was all about. Oops, did we just stereotype Americans as clueless idiots? Sorry. Which agency would like to step forward and take honors for this masterpiece? This is Bridge Worldwide from Cincy...small town hacks that used to work at P&G as the biz was walked to them. You complain that the concept isn't authentic yet you believe that microwavable food from a company that makes waffle fries is authentic Asian? Way to be aware of the world around you and welcome to the general public, ad-man. "choosing to highlight something other than the fortune cookie's place in China's rich culture might tax the brains of most Americans who can't even remember what the whole "shot heard 'round the world" thing was all about"
Sounds about right to me. Most Americans couldn't even pass a 4th grade Social Studies test and you expect them to understand 3000 years of Chinese culture? Ever hear the expression "Keep it simple stupid"? Should be "keep it simple and stupid" which is what most successful advertising seems to be. So are you saying that the Asian man isn't actually Asian? Because it doesn't look like a caucasian man pulling a Jerry Lewis. Shouldn't there be some personal responsibility involved? The Asian man didn't have to take on that role and apparently didn't take too much offense to it to not accept a paycheck. How is this any different from when you laugh at someone like Fran Drescher or Jerry Stiller for portraying thrifty Jews, Dave Chapelle for portraying a stereotypical African American or Margaret Cho poking fun at her family for their culture? All stereotypes all originate from somewhere - even I laugh at stereotypes of my own culture. But you might be right - perhaps they could have created a game where you stack up boxes of healthy choice to form a wall to keep your dinner table safe from Xiongnu attacks. Ask yourself - what is the most memorable part of your meal at a Chinese restaurant? I'm guessing most would say "fortune cookie" or "chop sticks." You cater to your demographic - you don't serve sushi at an Astros game and you don't expect a demographic raised on cable television to pay enough attention to a history lesson given to them by a frozen dinner brand. Also interesting that Joan Chow is the CMO of ConAgra. I would assume that she's Asian, and didn't find this offensive. This looks pretty tasteless, and irrelevant, dumb and stereotypical. Perfect for the American public! It is awful creative. Regardless, how does this help sell any product? Welcome to the Internet where you need to produce things that people actually want and are useful. Fire the creative directors/agencies that are still stuck in the 80's. Let them serve Healthy Choice in the cafeteria so they at least get to know the product. Ha ha, they took the site down. Mirror anybody? I need my daily dose of offensiveness.